It has been over a week since Samsung launched the Galaxy Beta Program in the United States, United Kingdom, South Korea and China. The program enables users to register for an opportunity to try Android 7.0 Nougat beta builds on their Galaxy S7 and Galaxy S7 edge. Samsung hasn’t confirmed as yet if this program is going to be expanded to other countries but there’s a possibility that it may be launched in the Philippines next week. 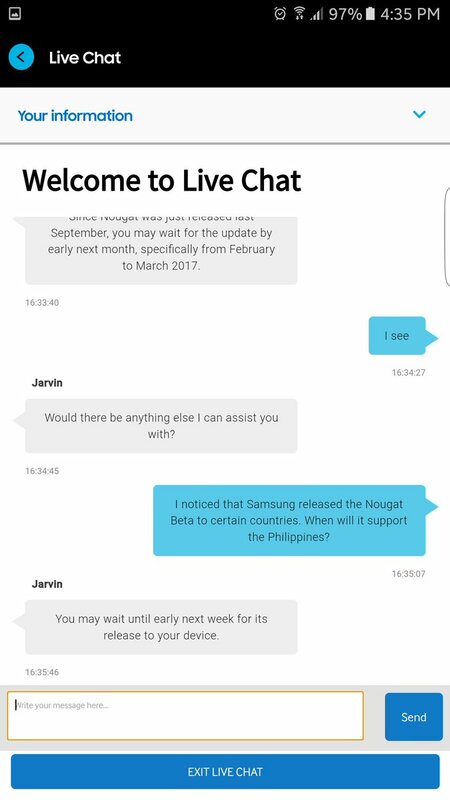 One of our readers has shared a screenshot of a live chat conversation with Samsung Philippines support. He was asking about the possibility of Nougat beta program being launched for users in the Philippines. “You may wait until early next week for its release to your device,” was the support representative’s reply, suggesting that the beta program might be expanded to the Philippines. It would be great if Samsung decides to expand the reach of this program but I won’t consider this to be a done deal just yet. Samsung’s support representatives have often made contradictory statements when it comes to firmware and even this representative’s reply doesn’t make that much sense. It’s not like Android 7.0 Nougat beta will be released to all Galaxy S7 and Galaxy S7 edge users in the country. The program requires interested users to register and it’s up to Samsung to decide how many get in. Like I said, Samsung’s decision to expand the program will be appreciated, but nothing concrete has come up so far to support the theory. If you’re interested in finding out what improvements Samsung is going to bring with this update, do check out our Whats New With Nougat series. They are not expanding beta program to India. Got reply from Samsung. Thats not the case for me. I just contacted the support and here are their replies. Thank you for your interest in Galaxy Beta Program. We have no plans to expand countries. LOL. Live support personnel just make stuff up on the spot most of the time. And update to Nougat (not beta) will be in Feb – Mar, so it can be after S8 announcement. Or maybe Samsung will ship 7.0 already in December, and leave the 7.1.1 initially as exclusive to the Galaxy S8, then send it to Galaxy S7, S7 Edge, S7 Active, Note 5, S6, S6 Edge, S6 Edge +, S6 Active, Galaxy A 2016 and Galaxy J 2016 (with the exception of J1 2016, J1 Mini, J2 2016 and J2 Prime). Wish Samsung UK gave answers like this, they don’t know a thing. They didn’t even know how to use Smart Lock when I asked about it. Have any UK users actually using it, I know it says its in the UK but my brother’s unlocked S7 edge here in the UK never was able to find the beta program app or Samsung members app in either the Galaxy Store or the Play store. This was well over a couple of weeks ago.